In Io Group, Inc. v. Veoh Networks, Inc., No. C06-03926 (HRL), a decision dated August 27, 2008 by Northern District of California Judge Harold Lloyd, discussed by PC Magazine here, the court found that the video uploading service found at http://www.veoh.com/ is not liable for copyright infringement. The Veoh website permits users to view and upload their own videos and to share revenues generated from advertising revenues with Veoh. Veoh automates the process, so Veoh is not engaged in reviewing content before it goes up. You can also watch television shows made available by Veoh's "content partners". I note such shows as CSI and Ugly Betty from Veoh's home page. The plaintiff sued Veoh claiming that its copyrighted films were posted on Veoh without bothering to give Veoh notice beforehand. The decision has a great discussion of the technology involved in the uploading and storing process. It also has a thorough discussion of Veoh's user policies and the legislative history relative to the Digital Millenium Copyright Act that provides a "safe harbor" to online service providers who take reasonable measures to ensure that they are not helping copyright infringers. There is an informative discussion of why Veoh's case differs from the facts of Napster, although the underlying facts of Napster were not fully fleshed out. In today's New York Post, the Veoh case was reported as "Copyright case may aid Google". Judge Lloyd found Veoh's policy to be reasonable, and rejected arguments that a stronger policy which would be more effective in barring people from creating new false user names was mandated as a condition for avoiding copyright infringement liability. He rejected the argument that the possibility of a banned user creating new false user names amounted to no policy at all. He also made clear that the law was designed to permit different approaches to developing an anti-infringement policy. Certainly, this flexible approach has to be encouraging to Google, whose policies were not 100% effective against people who actively sought to foil them. Redaction is the process of removing information from documents. You can see from the attached image, which is a slide that I recently used in a litigation, I have redacted the title of the slide using Adobe Acrobat 8 Pro. One of the most tedious and time-consuming jobs in litigation is producing privilege logs and redacting sensitive proprietary information such as trade secrets, medical information, credit card and social-security information from documents. Mistakes are often made, even by the largest and most sophisticated law firms. Computers and technology can ease the problem, but in the end, any mechanical device will make errors that need to be checked by thinking, trained humans. The combination of high-speed scanning and electronic filing requirements in many courts have forced the electronic age onto many litigators, and now the game is figuring out how to sort through, organize and work efficiently with large quantities of documents in PDF format. Fortunately, Adobe has created some powerful tools to save time and money. Let's say you have documents that need to potentially be produced to the adversary. Scan them. You can Bates-number them right in Acrobat (Advanced/Document Processing/Bates Numbering/Add). You probably want to break the documents down into PDFs of manageable size. Under the Acrobat "Document" dropdown menu, use "Recognize text using OCR". OCR is optical character recognition. It means that your computer will read the text contained in the PDF as text, rather than as an image. If a PDF is saved as an image, your computer will not pick up any of the words in the text. To create a privilege log, in looking for attorney/client or work product-privileged documents, one could simply search, say an attorney's name and go through one-by-one each mention. This is a slow process. If you go to the "Advance" dropdown menu, hit Redaction. Then "Search and Redact". A search on the attorney's name will now mark every instance in the document that the attorney's name appears and give you a handy table so that you can jump to each instance the name appears. Since you probable want to eliminate more information than just the attorney's name, you would mark for redaction (see below) all of the privileged information. To "blacken out" information that you wish to redact, once you have scanned and saved the PDF, go to the "Advanced" dropdown menu. Click on "Redaction". Click on "Show redaction toolbar". Now you can search the entire document to find every instance of a particular word, "Mark for Redaction" and then "Apply Redactions". Make sure to read the help features. Also make sure to save the document with a new name and to make sure to delete metadata as you are leaving the document (a self-explanatory screen pops up as you leave the document). Why is this redaction function so important? Well, according to Adobe, it really gets rid of the underlying information so that a tech person cannot figure out a way around it. There are some famous instances, reported here and here of people thinking that they'd blacked out information, but people were able to simply look behind the blackened-out portion to find confidential personal information and important government secrets. Caveat: read the help screens and warnings carefully. OCR is not perfect, and it will not pick up handwriting, images, or text that is not properly aligned. 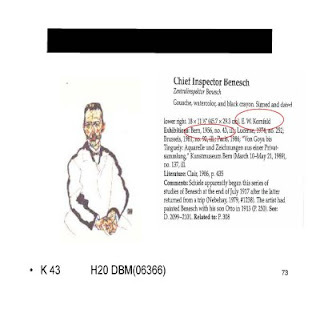 For example, the image above of Chief Inspector Benesch contained both text (the title) and a provenance of the artwork that had been scanned as an image. So if I searched the word "Benesch" to redact, the search function would not pick up the word "Benesch" from the image portion of the slide. DO NOT WORK FROM ORIGINALS. You must make sure that you have an entire original set saved somewhere safe, because redaction actually removes information, thus destroying the original file. Adobe puts warning screens in to remind you of this. There is no technological shortcut that will bypass a trained set of eyes conducting the review, but proper use of this powerful tool should be a big timesaver. The Second Circuit just reversed a district court decision that had permitted the heirs of John Steinbeck to terminate a copyright grant to Penguin Group. The issue arose from a termination right granted to authors and their heirs that corresponded to the extension of the copyright term. The logic was that if copyright terms were extended, publishers should not receive an unfair windfall without letting authors or their heirs renegotiate. An historic logic for letting authors terminate is that young authors would often enter into unfavorable agreements and giving them a chance to renegotiate later would compel publishers to reckon with the mature authors' better bargaining power. Steinbeck's widow had renegotiated a 1938 rights grant in 1994. The Second Circuit found that the 1994 renegotiation was a complete termination of the 1938 rights grant. Steinbeck's widows heirs tried to exercise their termination rights in 2004. But the Second Circuit found that, applying New York contract law, the 1938 grant had been terminated, giving the widows heirs no pre-1978 rights grants to terminate. Essentially, an author or heirs get one crack at renegotiating. --- F.3d ----, 2008 WL 3376654 (2d Cir. 2008).